Kayak rack this rack can be safely let you take a canoe trip also save you a space at the same time, under normal circumstances can be installed 2 1 car for kayak rack (set up two canoes on your roof）. The shelf is covered with soft cover and will not damage your kayak while loading the kayak. Kayak rack product use more extensive, carrying capacity of up to 150 pounds, use it can load the canoe, rubber boats, snowboarding, surfing board, such as outdoor products, even though you can also load decorated with a ladder, with a reasonable way of bundling as long as you can be secure. Of course, you must have two poles on top of your Roof Rack Cross bars when installing this rack. The product structure is reasonable, you only need to install the instructions in the packing box to be installed easily on the top of your car roof. For the most part of the market Roof Rack Cross bars, please check the installation size of the image before purchasing. You can also check the pictures to see the details of the accessories. The above instructions are 1 pair of accessories. We offer a lifetime guarantee and 100% refund service. 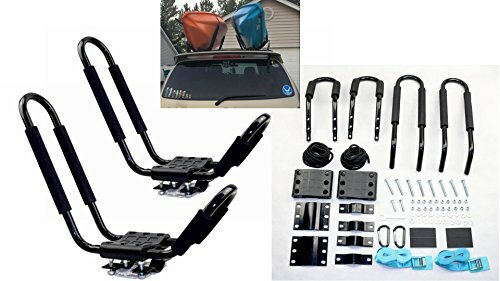 KAYAK CAR TOP CARRIER A simple, low-cost solution to carrying your kayak ITEM#: KAYAK-RK-J(1SET) CONDITION: BRAND NEW QUANTITY: 1 PAIRS. Features: Steel design with adjustable padding for carrying strength and kayak protection Wide mouth J bar offers easier loading and unloading Quick on/off hardware ensures fast installation and removal Optimally sized J style carrier leaves roof space All surface rust-resistant coating and hardware for longer product life Includes all mounting hardware and 2 straps Accommodates kayaks up to 36" wide and 75lbs Will fit most factory or aftermarket round,square,oval and flat crossbars. Can also be used as a canoe rack and to transport skis, paddleboards, surfboards, snowboards, wakeboards and other outdoor gear.Two pair of racks accommodate two kayaks up to 36" wide. If you have any questions about this product by Mrhardware, contact us by completing and submitting the form below. If you are looking for a specif part number, please include it with your message.